Black and White Chocolate Chippers... just like the mall but even better. 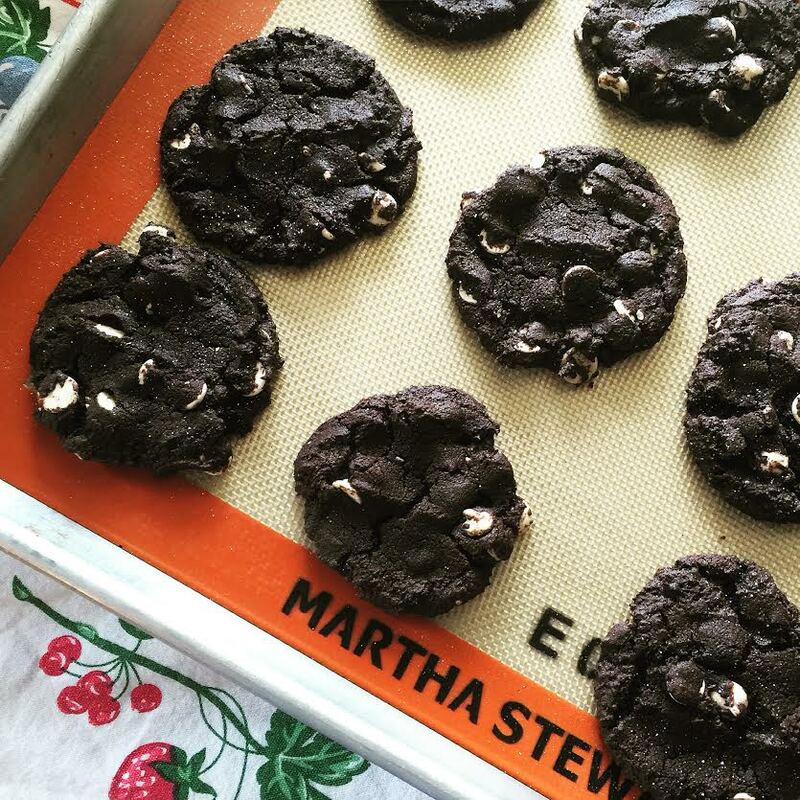 Another day, another cookie recipe, complete with quick instagram photo. I have nothing amazing to report except that everyone loves these. People ask for the recipe all the time so I figured it was time to repost it. The chocolate dough is absolutely delicious and very flexible. My brother in law always requests these with chocolate chips instead of white. I prefer white chocolate, Andes mint, or peanut butter chips in these. Reese's pieces or chopped up Reese's would be delicious too. Or mint M&M's. You can't go wrong here. To get the beautiful black color, use at least half Hershey's extra dark chocolate cocoa powder if you can find it (they carry it at my grocery store and it has a red label). I'm all for kitchen short cuts but don't forget to sift, or at least stir together with a fork the whole dry team in a bowl so it's evenly distributed. The cocoa powder is always lumpy for me. Preheat oven to 350 degrees and prepare baking sheets (Grease or line with silicone baking sheet or parchment paper). Sift together flour, cocoa powder, baking soda, and salt. Set dry ingredients aside. Cream together the butter, brown sugar and white sugar until light and fluffy (about 2 minutes in the KitchenAid). Add egg and beat well. Add vanilla and mix until well combined. With the mixer on low, slowly add in the dry mixture, stirring until just incorporated. Fold in white chocolate chips. Scoop onto the prepared cookie sheet and squish slightly if flatter cookies are desired (I think the cookies look prettier if they are squished about half way down before baking). Bake for about 8 or 9 minutes. Allow cookies to cool on baking sheet for 5 minutes before removing to a wire rack to cool completely. Serve with milk and store in an airtight container. Yes please. These are one of my favorites.